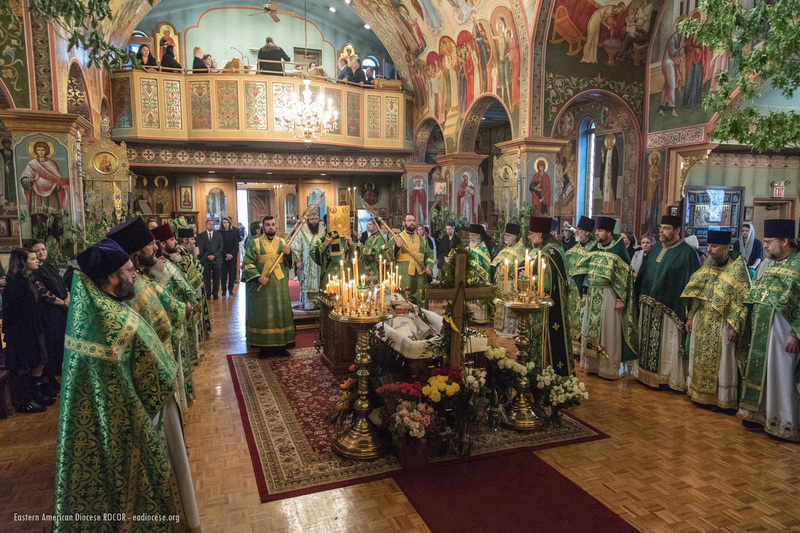 Early that morning, Divine Liturgy for the departed was celebrated by Eastern American Diocesan vicar Bishop Nicholas of Manhattan. Archbishop Gabriel of Montreal & Canada, who would lead the funeral service, prayed in the altar. Before the service began, His Grace tonsured Pavel Lukianov, Fr. Valery's grandson, a reader. Upon completion of Liturgy, the cathedral was filled with worshippers, who had come to pay their last respects and pray for the repose of Fr. Valery’s bright soul. 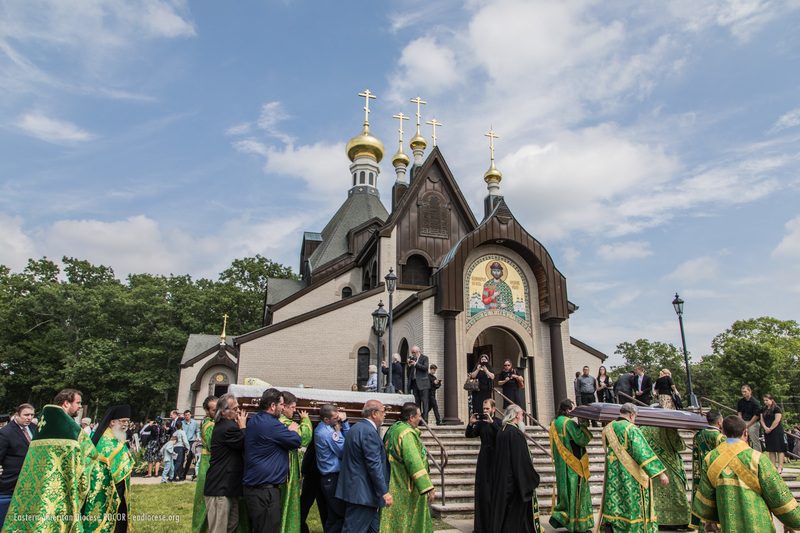 Archbishop Gabriel led the funeral, co-served by Bishop Nicholas and a multitude of diocesan, Patriarchal, and cathedral clergy Praying on the kliros was Metropolitan Hilarion of Eastern America & New York, recovering from a recent illness. Offering eulogies were Fr. Valery’s long-time friend and concelebrant, Archpriest George Larin (pastor emeritus of Holy Virgin Protection Church in Nyack, NY), Archbishop Gabriel, and Fr. Valery’s grandson, Subdeacon Peter Lukianov. Archbishop Gabriel of Montreal and Canada called Fr. Valery the connecting link between the elder generation of diasporan priests and new: "Father Valery was the last, in 1963, who was ordained to the diaconate by Holy Hierarch John of Shanghai, who he knew from his youth… He labored, was a true pastor for all who approached him. In 1987, when the Synod of Bishops requested he temporarily head the Russian Ecclesiastical Mission in Jerusalem, he accepted the obedience, and fond memories of his service remain there to this day. Returning to America, he built a new magnificent cathedral – one of the architectural masterpieces of the Russian Church Abroad. "In the last few years, despite his serious illness, Fr. Valery humbly accepted his ailment, never wavering in spirit, was joyous in spirit and rejoiced in the Lord… And today we are hopeful that the Lord accept Fr. Valery and give him rest in the bosom of Abraham, and the same joy in the Lord which he had and spread to others, we will always carry in our own hearts with warm memories of the last representative of the elder generation of the Church Abroad." 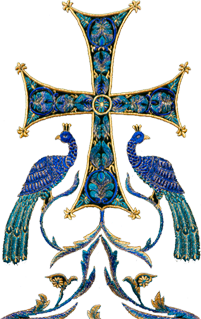 Archbishop Gabriel expressed his condolences to Matushka Irina, the sons and family of the departed, and expressed his joy that Fr. Valery will be buried behind the altar of the cathedral, where people may come to church, visit, and pray to their good pastor – Fr. Valery. In his eulogy, Subdeacon Peter spoke at length about the unseen aspects of Fr. Valery’s ministry over the course of over 50 years of priestly service. He shared so-called vignettes that his grandfather had collected throughout his life, offering words of wisdom, humility, grace, and common sense to live by. 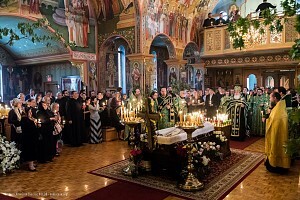 At the end of the funeral, Metropolitan Hilarion offered words of condolence to Matushka Irene, Fr. Valery’s sons, and the entire orphaned community of Fr. Valery’s spiritual children (until his last day on earth, after he was no longer able to serve due to his illness, Fr. Valery continued hearing confessions, consoling and counseling the faithful). Fr. Serge then read aloud a letter of condolence from Bishop John of Naro-Fominsk, Administrator of the Patriarchal Parishes in the USA. 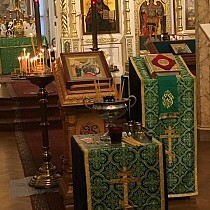 The funeral service completed, the hierarchs, clergy, and faithful went into procession around the cathedral three times, before stopping behind the altar, where the burial was held. The burial of Fr. Valery here is particularly appropriate: in addition to serving as the rector of St. Alexander Nevsky parish for 46 years (1968-2014), he also designed the new cathedral and oversaw every aspect of its construction. It seemed only fitting that, in blessed repose, he would watch over the church and the parish community as he had in life. Indeed, in days to come, a steady trickle of believers would come and offer prayers at his gravesite throughout the day. A certain celebratory atmosphere reigned among the clergy and people. Though there was sorrow at having to bid farewell to their spiritual father, there was also a sense of awe at the sheer magnitude of what Fr. Valery had accomplished in his long life. The last cleric to have been ordained by the Holy Hierarch John of Shanghai & San Francisco, Fr. Valery’s life was truly extraordinary: he raised five sons, authored several books, served on the Synodal Arts & Architecture Commission, led the Ecclesiastical Mission in Jerusalem, ministered to an ever-growing parish, and built a cathedral of unrivaled beauty. Having reposed on the leave-taking of the Ascension, his ninth day would be on the leave-taking of Pentecost, and his fortieth day – it cannot be by accident – will be on the feast of St. John of Shanghai, July 2. Many noted that the service – long, but filled with prayer and beautiful hymnody – was filled with joy at having known and loved this blessed pastor, and having had the opportunity to hear his sermons, attend his lectures, and receive absolution at his hands, it was said aloud by many that this was not merely a funeral, but a triumph of Orthodoxy.